Well, I’ve got a film done - the question now is what the hell do I do with it? Any answer I come up with just raises further questions. Do I shepherd it around to festivals? Do I put in online? Do I send it to every animation studio I can think of? Is animation even what I want to do full-time? There were so many other elements of the production that I enjoyed, like storyboarding and composing the music - would it be more valuable to pursue these instead, career-wise? Or, do I carry on doing the post-production and video editing work that kept me afloat after my BA and use the money I make from that to supplement animation as a hobby, as I do with my music? Lots of options, which I suppose is a good thing as it casts a wider net of possibilities, however one of my main goals in taking this MA was to narrow down my plan of action. That certainly hasn’t panned out. These days I’m mainly putting together press packages for festivals and sending off DVD screeners. To keep my nose clean, the version I’m sending out there is the shorter, less-sweary, non-copyright-infringing edit I described in the previous entry. When I decide to release it on DVD, this will be the version that goes on it for the same reason. The unedited, 17+ minute original version with that perfect song over the end credits will never get a screening now that the degree show is over. It’s a pity, because at the end of the day that, to me, is the true version of ‘House Guest’, even if the new edit does flow a little smoother. That’s why I’ve decided to bootleg myself! I can’t in good conscience charge people for a DVD of the original film when I don’t own all the music on the soundtrack, but if I’m just doing the rounds with friends and family there’s no real harm done, right? The oxymoronically-labelled ‘Official Pirate Version’ is as bare-bones as a DVD can get, containing the cut and uncut versions of the film but nothing else by way of extras. To give it a nice, animationey feel the packaging design is taken from one of the rough layout drawings and printed on clear acetate. The end result is simple but, I think, pretty nifty. I like to make geeky little ‘special edition’ packages - when I put out the last two Struwwelpeter albums ‘Rapeseed’ (2004) and ‘Agnosticaust’ (2006) I made a batch of home-made versions for friends, family and the first 100 people to order each album online. It’s a nice excuse to create extra album artwork, get creative with the packaging design and include music and video content that would otherwise never see the light of day. In this digital age my generation may very well be the last to take pleasure in the physical representations of movies and music. Sometimes the ingenuity of the packaging can even contextualise the media content. 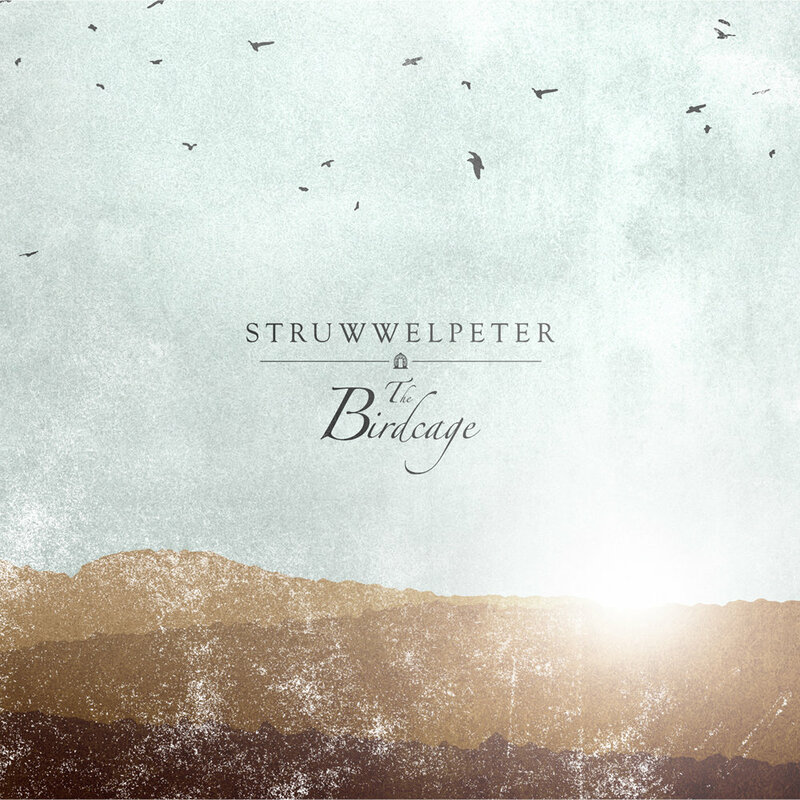 You just don’t get the same vibe from a JPEG in an iTunes ‘album artwork’ window. Well, the film is done. While there may be more alternate versions on the horizon, "House Guest" as I had envisioned it is now a fully-formed reality. In some areas it's a little less fancy than I expected, in others it's a little more. Better or worse though, it's finished. For now. So I'd like to take the time to personally (well, sort of impersonally given it's an entry in a weblog) thank everybody who made a contribution. First and foremost, my course leader Chris Webster whose advice, support and encouragement got the film started and kept my own interest in it alive. Of course it goes without saying that Joanna Hepworth was a vital contributor, spending countless hours cleaning up, inking in, colouring, animating and generally making the studio a more pleasant place to be. Without her selflessness I honestly believe I would not have finished on time, if at all. Two of the most important people to the film's development before production even began were screenwriting students Hanna Merilainen and Verity Ross-Smith. Both of whom went through the original script and helped me filter out the waffle, of which there was plenty. Actually, it was about 70% waffle which would've made the film about 50 minutes long. They were harsh but fair. My old Cheltenham College paisan Tom Bower did a fantastic job as the voice of the Duck, as did my thespian sister Erica who took on the Prospective Lay. Both of them injected more flavour and personality into the characters than I could have hoped for. There were also a number of altruists and advisors who were valuable to the film's completion. Rachel Robinson from UWE, whose candour was vital during the early months of production when my approach was a distinctly more limited one. Her advice inspired me to strike a fairer balance between economic and full animation. Mary Murphy, also from UWE and one of its true unsung heroes. Probably the best person for technical support and advice with a truly laudable no-BS policy. Philippe Vaucher, who left Bristol last year to work in Quebec, selling me my beautiful lightbox Molly. Obviously without her there'd be no film at all. It is a little troubling that I've named my lightbox and decided it's a she, but that's just one little tile in the vast mosaic of my idiosyncrasies. Special mention has to go to the many baristas of Bristol, especially the ones who worked in Caffè Neros. Over the course of the film's production I managed to see about five generations of staff come and go from one specific branch, including that incredibly hot, tall, bald German one who wore shirt buttons as earrings. Pretty much everyone who had to serve me coffee after coffee after coffee did so affably and having the café to go to as an alternate work environment was a real boone at times. Finally, the man who got me through the most tedious times during production, although he could not have known it, was radio host Adam Carolla. Happening upon his show by chance back in September, I found him instantly endearing through his natural delivery and outlook on the world and mankind. Whether listening to the current morning show during the week or old episodes of Loveline on the weekend, having a backdrop against which I'd scan, colour and compile ad nauseum made the work immeasurably more bearable. Also thanks to his co-hosts Teresa Strasser, Bryan Bishop and the genius Dr. Drew Pinsky. One of my larger fears when I began working on the film was that it would wind up being a solitary and lonely experience. In reality it was anything but, and I am deeply grateful to my friends and associates whose names bulk up the credits for making an effort, be it small or large, and for no other reason than 'just because'. It is a nice feeling. This is the essay I was required to write and hand in alongside the finished film. Its purpose is mainly to contextualise the project as a whole and justify the choices I made along the way. A PDF version featuring endnotes, annotations and appendices can be downloaded here. While it would be accurate to state that “House Guest” is the product of two years’ work, the desire to produce animation of this kind goes back beyond a prior degree, beyond even secondary school to pre-adolescence. Perhaps the tie that binds all whom I’ve encountered of late, those able to both sacrifice their time and invest themselves emotionally in animation, is the ability to retain the same wonder for the medium they felt during childhood. While the means and motivation to act on it in practical terms had been dormant for a number of years prior to my becoming a UWE student, it has never really left me. 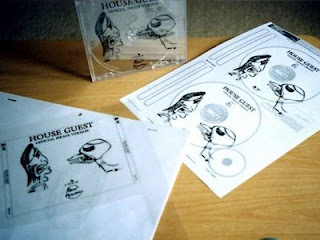 With that in mind, having the opportunity to produce “House Guest” was an experience that I embraced with more enthusiasm than any project in recent recollection. My main aim when beginning this MA was to refine and develop the moving image skills I acquired on my prior BA . While these encompassed all manner of design, modelling and typographical skills, I became dedicated to the idea of extending them to character development, character design and even narrative. While my BA’s final major project, a series of music videos, allowed me to marry my technical grasp of the software and its processes with rudimentary characters, premises and settings, this in a sense highlighted a tremendous ignorance of animation and film-making principles on my part that a more specific, less graphic design-oriented course might resolve. Ultimately I felt that simply being able to showcase a knowledge of software expertise would not guarantee a career beyond post-production, and in taking this animation MA I could determine whether or not I might be suited to a career more dependent on my own individual creativity and potential. •In order to appropriately present whatever story I wished to tell, a proper understanding of animation principles beyond moving image, to being able to appropriately ‘act’ using timing, emotion, weight and composition, would be vital. •Given that my prior major projects were done as mostly solo affairs, I felt it would be tremendously valuable to collaborate with others so that I might be more at ease with having ideas grow naturally through group efforts. These would ideally involve both projects in which all contributions would be equally considered as well as emulation of industry environments with allocated positions and hierarchies. •Having focused a previous dissertation on sound design in film and depending on a non-academic passion for music composition, production and promotion to supplement my income for nearly a decade, I felt that it would be valuable to also draw upon and improve these self-taught abilities and apply them to whatever projects the MA might present. Once the project itself was established, I found myself having to refer to my stated aims and work out what precisely my goals would have to be. Standing out as the primary objective was to create a film that could work on two main levels, one being as a stand-alone film, in which the story contained within demonstrated an engaging arc that came to an appropriately-timed climax and subsequent conclusion; the other being as a starting point for a series in which the established setting and characters could engage in further exploits, should the film’s public reception warrant it. Alongside this goal would be a commitment to a further understanding of the animation industry and the variety of positions and careers it offered. It would then be important to gauge which of these would be most appropriate, weighed up against whichever elements of production I found myself best suited to. In doing research for the film I needed to establish a preliminary understanding of context, so that I could better determine its aesthetic, pace and eventual distribution. It is, in temporal terms, a contemporary story, taking place in the present day with reference to modern amenities and culture. With that in mind, the issues depicted (later discussed under ‘Communicating Key Concepts’) are in a sense timeless, adhering not to any specific political climate nor referring to subjects of a topical nature, save for a banal discussion of ‘pop culture confusion’ during the film’s final scene. Mostly the themes are social, though specific to interpersonal relationships, rather than being thematically societal as a whole. The events of the story take place in an unspecified geographic location, a woodland area only acknowledged as ‘the middle of nowhere’. The audience can determine from the accents of the characters that the setting is somewhere in the UK, although through artistic license the landscape is predicated more on the Canadian Laurentians, creating an ambiguous, hybrid backdrop against which the action takes place. Lake Anne, family home located in Quebec, served as a loose basis for most of the film’s exterior background designs. In evaluating its geographical context it would thus be more prudent to refer to the film’s stylistic choices and their cultural influences. While initially I had assumed my natural style development was derived from US comic strip culture - whose practitioners such as Gary Larson, Bill Watterson, Charles Addams and John Callahan I had held in high regard - a number of correlations between my visuals and those of UK-originated comics were identified by fellow students and the course leader. While this was unintentional, having little personal interest in comics such as “Beano” and “Viz”, said similarities are clearly identifiable, perhaps due to a shared lack of artistic structure and proportion the US-based comics maintained. With these elements anchoring my film to British culture, another geographical consideration to allow for would be that of my heritage exposing me to Canadian animation, with practitioners such as Cordell Barker, whose animated work includes 1988’s “The Cat Came Back” and 2002’s “Strange Invaders”; and John Kricfalusi, who reintroduced the concept of creator-driven cartoons in creating “The Ren & Stimpy Show” (1991-1996). In addition to both practitioners’ shared use of freeform, unrestricted animation, Kricfalusi’s own work as an animation historian served as a crucial source for research. In a regularly-updated public journal he collates all manner of historical materials, alongside technical advice and rare archival footage. While Kricfalusi is possibly my main contemporary influence, several others have stood alongside him such as Bill Plympton, Mike Judge, Ralph Bakshi, and of course the great pioneers of animation such as Chuck Jones, Bob Clampett and Tex Avery, whose work has proved itself to be so timeless as to still be a cultural staple even today. Examining the development and distribution of the film after its initial completion, I also felt it necessary to research the instances in which short films were developed into serialised franchises. Chief among these practitioners were Kricfalusi himself, whose short film “Big House Blues” was pitched as a pilot for “Ren & Stimpy”, along with several others. Seth MacFarlane, whose short film “Larry & Steve” evolved into “Family Guy” (further research into the technical elements of this show’s production is later discussed under ‘Strategies’); Trey Parker and Matt Stone, whose collaborative shoestring piece “The Spirit of Christmas” became the foundation for “South Park”; and Craig McCracken, possibly the most interesting instance in which numerous elements of his film “Whoopass Stew” were watered down to develop the children’s television series “The Powerpuff Girls”, unexpectedly creating a superior product as a consequence. Several essential texts on the animation process and industry were frequently referred to over the course of this film’s production. While a full and extensive list can be found in the bibliography section, there were several which stood out as being the most accessible and frequently consulted. Paul Wells’s “The Fundamentals of Animation”, in which every production process for an animated film is broken down and articulately communicated, addressed the large amount of labour that would be required and allowed me to draw up a feasible production plan. In terms of cultural context, the book most relevant to my potential use for “House Guest” following its completion was Allan Neuwirth’s “Makin’ Toons”, in which a number of contemporary television shows’ creation, production, distribution and public reception are examined. While Richard Williams’s frequently acclaimed “Animator’s Survival Kit” gave, in my mind, little concession to the first-time animator, similarly theory-centric texts proved essential, such as Preston Blair’s “Cartoon Animation” and course leader Chris Webster’s “Mechanics of Motion”, the latter also serving in many respects as a companion handbook to the MA itself. Bird Take-Off (from Chris Webster’s “The Mechanics of Motion”) & The Cartoon ‘Take’ (from Preston Blair’s “Cartoon Animation”) as demonstrated in “House Guest”, examples of how source texts were used as outside consultation for animation theory. Beyond animation itself were a number of practitioners whose use of cinematography was strongly influential. David Lynch’s use of protracted, ominous setups and tracking shots were carefully examined when contemplating the direction of the earlier “House Guest” sequences, in which the tone is decidedly sombre. In terms of screenwriting I took as a springboard the work of Charlie Kaufman, with his ability to underplay scenarios that would in other hands be considered ludicrous. This was a key contributor to the narrative style of “House Guest”, by unconventionally juxtaposing the macabre, possibly unsettling visuals against casual duologues between the two main characters. During pre-production I approached the execution of this film in several ways before settling on the eventual plan of action. With the assumption that this course would follow on directly from my BA and its own technical processes I began working initially with the intention of creating the film using computer generated (CG) animation. This strategy, although in its early stage demonstrating some visual potential, was ultimately abandoned for two main reasons. The concept art I showcased during my pitch presentation at the end of the first semester was better received than I had anticipated, being essentially hand-drawn sketches. When I eventually resolved to produce the film using traditional, 2D hand-drawn animation it was a consequence of several tutorials in which both my faith in that ability was strengthened, along with my desire to create something using a process I was comparatively unfamiliar with. The MA as a whole presented a number of other opportunities that would allow me to explore other methods and styles, including a one-minute pixellation/rotoscoping experiment entitled “Narcissus”, in which live action footage of myself was printed out frame by frame to be physically manipulated (torn, creased, traced over etc) and then re-animated. Two collaborations with members of the Royal Academy of Music also managed to positively affect the development of “House Guest”, the first an opportunity to refine and test my editing and post-production skills by bringing together UWE student animation with RAM student music. As the two elements were created independently with little to no communication this proved to be a daunting but ultimately successful venture. The second collaboration, “Nebulosity”, was a shorter, more low-key project and a welcome opportunity to return to the abstract CG animation that I otherwise would not have had time to indulge in. The first visual stage of the film following the completion of the script (later discussed under ‘Communicating Key Concepts’) came the character design process. To come up with original and interesting character designs I divided the process into two stages. Rather than begin with one idea and refine it, I initially created as many designs as I could that had their own unique features and implied personalities. Once one design for each character that best suited their written dialogue was selected the second, far lengthier (though more organic) stage began. This was essentially the way in which each character developed proportionally throughout the concept art, storyboard and layout stages. While the aforementioned concept art served as a definite springboard for the eventual look of the film, when compared to stills from the finished film a distinct evolution can be observed. This is most notable with the Duck, whose face is blank and impassive in the original sketches but with some adjustment to the beak and eyes the character winds up as perhaps the most facially emotive in the film. This first stage of development is worth noting here as it is perhaps the most crucial in terms of determining the eventual aesthetic of the finished film. The subsequent developmental processes have been chronologically documented in the film’s production journal , in the form of an online weblog that I began in February 2007 to best keep as a reliable reference for the entire process. When considering a film whose story has no political agenda or content analogous to any specific facet of society, it becomes harder to articulate its intentions or the inherent concepts within. I chiefly began work on this project to create a story that would hopefully be considered entertaining and amusing for its own sake, much like the cartoons I watched growing up. The universally appealing era of, for example, the Looney Tunes franchise, would be the years in which the characters developed against a backdrop of pleasing visual lunacy. The earlier years in which matters of the second world war and politics were a notable presence have not dated as well, their audience being more or less limited to animation enthusiasts and historians. Without consciously realising it during the scriptwriting stage there are, in hindsight, a number of clear themes and concepts being articulated, drawn from a number of real-life sources. When you strip the story away from the unusual visuals and initial premise, what is essentially being depicted is a story about emotional manipulation and the dynamic created between two individuals when this is taking place. This type of unhealthy partnership is perhaps the most relatable aspect of the film, as anybody could find a correlation with a personal relationship of their own, or at the very least one they had witnessed. It boils down to the influential party - the Duck - contorting and re-routing every conversation so that it plays on the guilt and subservient nature of the acquiescent party - the Hunter. While the audience would initially conclude that the Duck’s predominant emotional currency is reasonable, having survived an attempt on his life by the Hunter, the abrasiveness and incrementally more sinister nature of his personality create an ambiguity as to whom the viewer should root for. There is also little to redeem the Hunter save for his position as the subjugated host, and the other major player in the film (the nameless Prospective Lay who appears in a single scene) is, while seemingly the most endearing character, undermined entirely by an inexplicable attraction to the Duck, through his demonising the Hunter. Having the audience switch allegiances is another unintentional but positive by-product of the story, as with life there are no clearly defined heroes and villains. Some of the most critically-revered television series in recent times have been those in which audience opinions and loyalties to each character vary with some consistency. The scene in question shows none of the characters in a positive light, although by this point there is hopefully some affection for them on the part of the viewer. It bears some thought, then, as to who the viewer may actually be. My intended demographic at the film’s inception was, perhaps egocentrically, myself, being unsure as to how public interest would develop over the course of the eighteen months that followed. During the essential filtering of the script I gave more thought to which segments were accessible to the general public and, with the aid of a script supervisor, removed all the material I felt to be self-indulgent and non-relatable to an audience. These stood out markedly by referring to obscure pop-culture references and in-jokes that would have been ultimately meaningless and slowed the pacing of the film needlessly . The refined script retains the coarse language and disquieting imagery that automatically limits its audience to those above a certain age. When testing sections of the film on a variety of subjects , the age range that responded positively spanned early-teens to late-twenties, with the latter group most likely requiring a pre-existing fondness for animation. Ultimately I concluded that I was looking at a solid audience ranging from 17-23. Curiously enough, while I had anticipated that men would be more receptive to the content of the film than women, I wound up with a fairly equal divide between the two. A major hurdle that one will inevitably face when dealing with animation production, regardless of the content itself, is that most adults above a certain age have an automatic cynicism toward the medium due to its main association with children’s programming. Even in today’s era which has seen such expertly-crafted shows as “The Simpsons” and brilliantly-observed political satire as “South Park”, there remains the aesthetic element of childish or crude visuals which will inevitably limit a show (or film)’s potential to reach a wider audience, regardless of its content. While I incorporated in the storyboard numerous shots that warranted full animation, I also felt it essential to embrace the limited animation techniques that make serialised cartoons possible. This is an economical process that draws upon the use and re-use of layouts, movement cycles, lip-sync as well as character expressions and poses. Hannah-Barbera’s mass-produced television series such as “The Flintstones” and “Yogi Bear” took this method to an extreme, no doubt as a means to decrease the production time and costs for an average episode. The visual result is a stark contrast to the more considered animation produced by Disney and Warner Bros., not just in the limitations of the character movement itself but also through the simplicity of each shot’s composition. Rather than embrace the infinite possibilities of cinematography animation could allow, the shows are little more than moving comic strips. Despite the absence of such substance to the visuals, they are successful in as much as the stories are told comedically and clearly, with character personalities crafted through their dialogue and respective story arcs. In more recent episodic animation this process is present but not as glaringly so. “The Simpsons” and “Family Guy”, both shows driven more by the dialogue than the animation itself, use economic processes but take the time and consideration to set up each shot with its own layouts. To pad out long stretches of dialogue where little body language is necessary, the characters in frame will shift through alternate poses to break up the potential tedium of a shot. Given that the fundamental reason for the atypically long running time of “House Guest” is the number of dialogue-heavy sequences, this technique was one of the more crucial facets of economic animation to emulate. In identifying which types of expression were required for a scene I created a base pose and several others indicative of different emotions. These were then co-ordinated on the timeline with the dialogue so that the facial acting would appropriately fit with the words being spoken. A crucial factor was to make sure each pose was, while noticeably different from one another, not so removed that the lip sync ‘cels’ would no longer match. As the Duck’s ‘beak-sync’ incorporated nostrils this was especially important. Inevitably this would overly limit the allowed movement on occasion, and for more emphatic and complex animation new lip-sync charts were needed. Oftentimes though this extra effort was weighed up against the prospect of simply fully animating a shot with the lip sync and movement transcribed together on a dope sheet. On top of the considerations for the movement were the individual poses themselves, the style and positioning of characters within each shot to retain a level of interest to the viewer. My ultimate intention was to have a film that would remain interesting even with the sound off, thus eliminating what could arguably be considered its main foundation - the dialogue. In researching this element the previously cited examples ultimately fell short, as the character designs for shows such as “Simpsons” and “Family Guy” are, though endearing, severely limited in terms of allowed expression. The same would be said for the aforementioned Hannah-Barbera-produced series, were it not for a handful of contemporary re-imaginings by John Kricfalusi in the late nineties and early 2000s. In these short films we see established settings and characters given an imaginative, distinctly Kricfalusian twist to their visual and narrative style. While the darkness of the new humour borders on being inappropriately adult, the true virtue lies within the freedom of Kricfalusi’s adapted character designs, not being limited to strict model sheet specifications. This freedom, established by Bob Clampett during animation’s golden age, has consistently been a staple of Kricfalusi’s style, and is more naturally suited to full animation. Married with economic animation however, it still manages to generate a tremendous amount of character and pure subversion that was absent from the shows’ original incarnations. All the discussed facets of such an approach have been both consciously and unconsciously incorporated into my film. 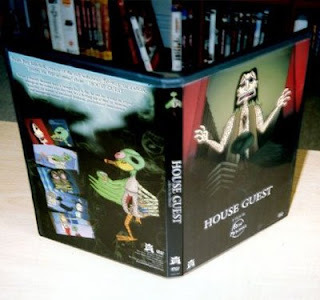 In reviewing the overall story of “House Guest”, there is a darkness and tension that builds within the first few minutes, quickly dropping to light fare when the Duck reveals himself to be anthropomorphous, soft-spoken and of no physical threat. As the nature of the Duck’s true personality slowly reveals itself while the film progresses said tension begins to rise again, albeit at a less perceptible pace. The visual style corresponds to this, an example being the Hunter’s initial fear at the start and encroaching lunacy toward the end manifesting itself through a variety of unregulated, off-model poses and expressions. During the interim the visuals are far more restrained, possibly even dull, but appropriately so. If a character grimaces or gesticulates alarmingly when the circumstances don’t call for it the result is jarring and has the potential to convolute the story. Just as ineffectual would be a character emoting under great duress while their face and body remain still and impassive. In creating a direct correlation with the narrative events I feel that the best balance has been struck. For each shot that was not dependent on limited animation there was potential to incorporate a number of vital techniques that I felt compelled to pursue as an animator. The animatic, essentially stills from the storyboard timed to a dialogue-only soundtrack, helped to determine which shots would warrant these experiments. While I was eager to work out a means of including visuals that could showcase a knowledge of classical animation theory I felt that they should not be simply there for their own sake. Consequently these types of shots were limited to brief sequences in which they might appropriately accentuate the drama or comedy of a scene. In the final film there are examples of walk cycles, flight cycles, weight and balance, complex head-movements, squash-and-stretch and, perhaps most challenging, an animated ‘tracking shot’. To create the latter involved the use of my previously constructed CG set and rendering out a point-of-view (POV) movie file in which the camera goes through the Hunter’s house. To make the eventual shot stylistically consistent with the rest of the film, each frame of the movie was rendered out and the smooth geometric visuals traced over in pen. Then each frame was coloured and placed on the timeline as a perpetually moving background to give the illusion of a POV chase sequence. While the other experiments warranted stronger justification for their inclusion, from the outset the emulated tracking shot was created chiefly to look impressive. Fortunately in the context of the finished film it appropriately breaks up the regularity of the sequences that build up toward it. The soundtrack for the film was a two-step process, each step taking place a year apart from one another. To begin with the dialogue was recorded in April 2007, using my own voice for the Hunter which had tested well when showing the initial animatics during the pitch presentation. For the Duck I was able to call upon Tom Bower, an associate from secondary school with whom I had been involved in numerous stage shows and consequently knew could act. I also felt that his voice would be a comedic juxtaposition along with the bizarre visual of the partially-decomposed Duck, being essentially deadpan and not contrived as my prior attempts to voice the character had been. What I had not anticipated was the additional layer of character he imbued the Duck with, heightening the passive-aggressive dialogue and occasionally incorporating supercilious affectation into his accent. For the Prospective Lay I felt it judicious to draw upon my sister Erica, being a classically-trained actor herself. In a similar fashion she was able to embellish the dialogue with a greater sense of personality that in turn influenced the eventual animation. Indeed, all the vocal performances became large contributors to the direction of the character acting once the animation process began. This unexpectedly lent a far greater substance to the overall visual style of the film which I had not anticipated, initially assuming the dialogue would carry the film more and that the visuals would come second for longer stretches. By the end the result turned out to be far more balanced. The second and final phase of compiling the soundtrack began after all the footage had been completely animated and edited together. Essentially this involved mixing together the numerous layers of music, ambient noise, stock effects and personally-produced foley sounds so that a fuller aural landscape would accompany the visuals. This result of this process is the driving force behind the film’s atmosphere, and a fundamental contributor to its credibility. While it would be impossible for an audience to completely suspend disbelief when dealing with this type of film, the attention to detail in its sound design goes a long way toward creating a more believable universe and actually makes the viewing experience a more comfortable one. By the end of the MA’s first year I knew that my film was going to require a consistent schedule if it were to be completed. In July 2007 I drew up a production plan that broke the film into stages, beginning with layouts and backgrounds that were produced over the summer break, being the least demanding (though fairly crucial) phase on which the bulk of the eventual animation would be predicated. Once the post-production module began in September the within-scene animation was broken down into segments, carefully planned so as to be feasibly achieved without a danger of overwork. This production plan was, once in place, stuck to as rigidly as circumstances would allow. On certain occasions there were instances of reordering; if circumstances dictated I would be away from my studio or the university facilities for a period of time, then the weeks prior would need to be rearranged so that I would be able to do work not dependent on access to a computer (such as cleanup or in-betweening). Knowing that the film could not be animated using entirely traditional processes and materials I created a system that appropriately emulated acetate cel animation while incorporating digital processes to save on production costs. Each cel or layer was hand-drawn in construction line form, then scanned in to line-test the movement. Following any tweaking to the timing that might be warranted, character detail was added to the geometric designs and a second line test done to test for proportional consistency. Once any issues that might arise during these tests were resolved, the pencil drawings were inked-in and cleaned up, so that they could be scanned a final time as 300dpi black and white bitmap images. These images were then pasted into Adobe Photoshop so that they could be coloured, with all blank/white space isolated and made transparent. For each shot a .PSD (standard Photoshop format) file would contain all the required cels, grouped together so that they could be easily imported into Adobe After Effects, a post-production software application that allows for a greater degree of control over timing, editing, visual effects and detail (when used in tandem with Photoshop) than most standard 2D animation programs. By including a systematic description of this process in the critical evaluation my intention is to provide an example of my own personally adapted methodology, using a researched procedure as a basis and generating my own solutions to issues such as time management and material costs. One of my larger concerns during the film’s production was outsourcing, being naturally protective of the characters and wishing for their style to remain distinctly my own. In bringing on other practitioners I felt that their own processes, methods and visual styles would bleed into the film and create inconsistencies. As such I knew that if I were to entrust anyone to take on such a position then we would ideally share influences, tastes and be of the same mindset in regards to the aims and objectives of the film being produced. While I could not have predicted the panning out of such a set of circumstances I was fortunate enough to develop such an affinity with Joanna Hepworth, a former UWE student who initially came on board as a clean-up assistant. Acknowledging her own technical skills demonstrated with the BA film she produced, the subsequent understanding and rapport that developed cultivated a trust that led to her being ‘cast’ (in terms of the character animation) as the film’s nameless female ‘Prospective Lay’, whose attentions the Duck and Hunter vie for. As a fellow student on the MA had similarly shared the animation load with an outside assistant, I wanted to avoid the dynamic of their work relationship, the assistant essentially becoming his protégé and frequently in need of assistance herself. While it proved to be a positive experience for both, this significantly slowed down the production process. Contrarily my dependence on Joanna was predicated on the certainty that her ability, creativity and understanding of animation principles matched my own. In numerous respects her work animating the Prospective Lay actually demonstrated a higher level of consideration, giving the character’s movement a sense of subdued grace that distinguished her from the appropriately slapdash, jerkier motion of the comparatively uncouth Hunter and Duck. In retrospect then, what had been my primary concern of having an outside influence on the film’s style turned out to be beneficial and one of the most important components of the practical work. The additional outsourcing essentially boiled down to division of labour, allocating clean-up and colouring to a number of fellow students gracious enough to give me their time . While the margin of error for these jobs was minimal, being essentially menial, by-the-numbers work (such as inking-in pencil lines and colouring in Photoshop files) I had little cause for concern. The important consideration was to make a note of everybody’s respective contribution so that they could be fairly credited. The latter portion of this evaluation is being written in tandem with the final stage of the film’s post-production, so that a fairer and non-speculative conclusion can be drawn. The elements of the film I feel have best met the stated aims and objectives are numerous, but most of all it is the success of creating a fictional universe whose inhabitants are relatable and engaging, with personalities that conjure emotions and investment from the audience. While this is a less tangible facet of the film than, say, the variety of described technical processes I have familiarised myself with and drawn upon, it is essentially both its foundation and the glue that sticks it together. That is to say, the initial premise is essential for the film to exist at all, and the narrative created as a consequence is equally necessary for the film to progress and, one hopes, retain staying power. While I cannot speculate as to the film’s public reception en masse, I would like to think that at least for every person who is indifferent to “House Guest” there is one who engages with it positively (or even negatively, as to provoke any notable reaction is to succeed on a certain level) enough to wish to see it a second time or possibly more. Working alongside this element would be the character animation in itself, even during the higher percentage of shots in which limited animation was used. The movement and facial expressions, both subtle and grandiose, as well as the overall look of the character designs, garnish the accompanying dialogue so as to fully flesh out the persona and individuality each character possesses. While there are still issues I have yet to fully resolve, mainly involving weight and follow-through movement, I feel that for the most part I have made strides and the level of technical proficiency is suitably appropriate for the tone of the film. There are some elements that, in hindsight, would benefit from alteration. On occasion there are lines of dialogue that would provoke laughter from test ‘audiences’ in script format, which fall flat in the finished film either through the vocal delivery or simply the context of the onscreen visuals. This however has worked both ways, with lines that had little resonance when simply on the page eventually soliciting some of the most positive reactions within the environment of the final film. In addition to this I, as the film’s originator, am viewing it with a more critical eye than the average viewer and am tuned-in to all manner of issues, from almost pettily minor (such as slightly mis-timed lip-sync frames or occasional miscoloured cels) to considerable concerns as to the pace of the film, due to a late removal of a scene that, while slowing the story down when included, hastens it perhaps too much when omitted . In terms of my methodology, I do not entirely regret the approach of generating the majority of the film’s content through the described process of scanning in individual hand-drawn cels, but this commitment was undeniably detrimental to the production speed, an issue that would be resolved (alongside the conservation of paper) through future use of a Wacom tablet. While I genuinely don’t believe I handled my time-management poorly, the experience has definitely taught me a great deal about planning ahead. The virtues of factoring in leeway in case of technical issues and unforeseen circumstances that may present themselves were also highlighted. In the case of “House Guest” these issues were minor but enough to warrant some last-minute compromises and rescheduling. While the version of “House Guest” I am submitting for assessment is finished as far as it fulfils my initial aims and objectives, it is not necessarily final. I believe it stands on its own but I may find myself embellishing or re-editing it to suit a number of different purposes. First and foremost would be for festival submission, the stipulations of which may require changes to the language, content or runtime, as well as further consideration to numerous ‘borrowed’ elements that are present in the film currently under fair use. These chiefly involve a small number of stock music cues which, if shown outside of a university environment, would either need to be paid for or replaced by alternate music of my own composition. There has also been some contemplation as to whether the film and/or the ideas and characters within it have the strength to exist beyond “House Guest”, as either subsequent films, graphic novels or even an animated series. I intend, with guidance from UWE staff and the industry contacts I have accrued during my time on this MA, to approach any and all receptive parties (including animation studios and television networks) with these ideas and from those encounters at the very least be able to gauge the climate of today’s animation industry and have a clearer idea of the general public’s interest in it. As far as employment within the industry I feel that working on this project has honed skills in far more areas than I had anticipated. Being essentially at the helm of almost every element of pre-production, production and post-production has seen me explore and familiarise myself with multiple areas such as storyboarding, layouts, character design, key-frame animation, in-betweening, cleanup, colouring, lip-sync and further developed abilities already in place such as editing and sound design. In truth I believe that in the overall execution of this film I have become employable in all of the above areas, and in certain instances (such as storyboarding) quite accomplished. 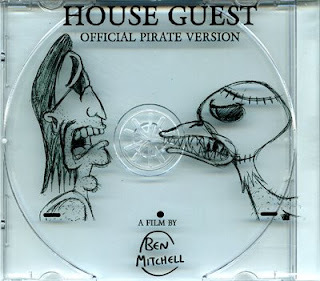 I chiefly feel that, with “House Guest” as my primary citation, I would be best suited as an animation director. My employability in this regard is ultimately dependent on how the film will be received overall and whatever positions I am able to obtain for myself within the industry in the years to come.